Tropical Storm Frank weakened to a tropical storm on July 28, 2016 and satellite imagery shows that winds and thunderstorms have continued to weaken. 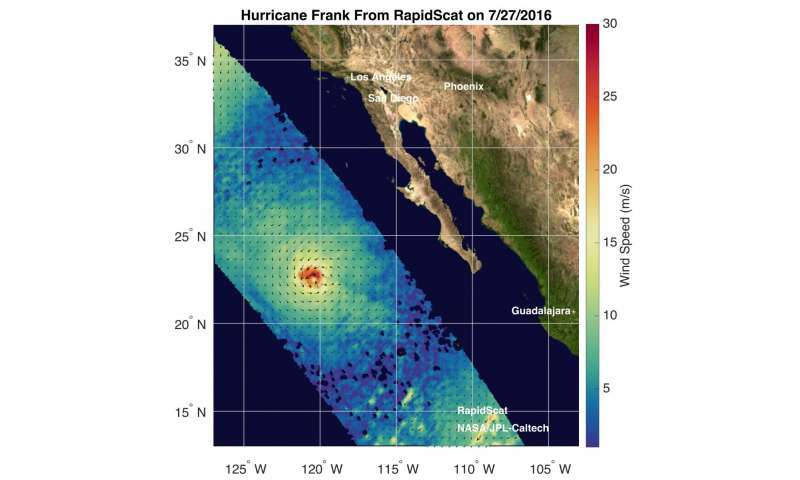 On July 27, NASA's RapidScat instrument observed Frank's strongest sustained winds were near 30 meters per second (67 mph/108 kph) north of the center. Tropical-storm-force winds extended outward up to 60 miles (95 km) from the center. 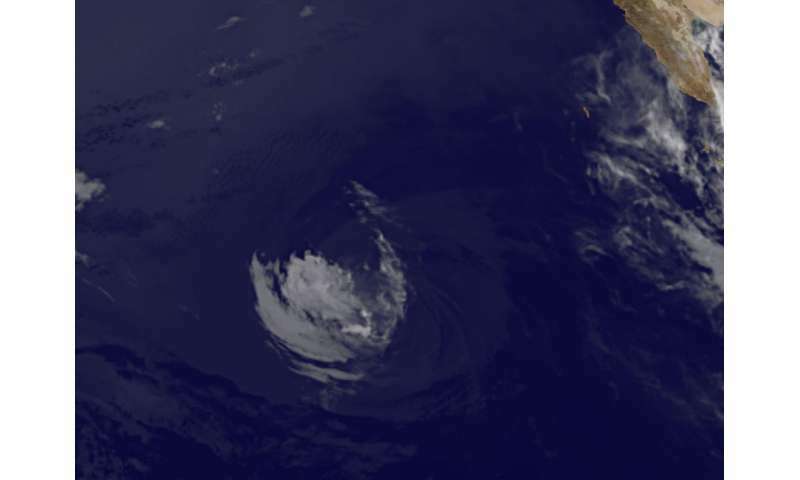 Frank weakened from a hurricane to a tropical storm by 5 p.m. EDT on July 27. The RapidScat instrument flies aboard the International Space Station and measures winds over an ocean surface. Images are created at NASA's Jet Propulsion Laboratory in Pasadena, California. 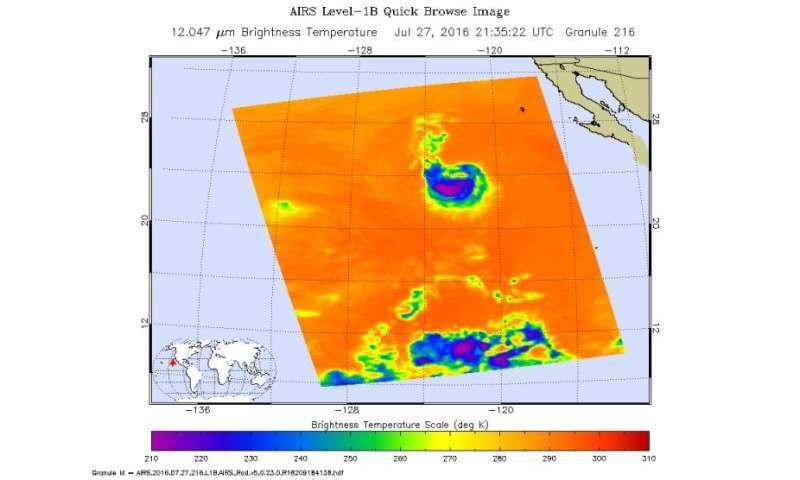 Later on July 27, at 21:35 UTC (5:35 p.m. EDT) the Atmospheric Infrared Sounder or AIRS instrument aboard NASA's Aqua satellite captured infrared data of Frank. The AIRS data showed that the coldest cloud top temperatures of at least minus 63 degrees Fahrenheit (minus 53 degrees Celsius) and strongest thunderstorms were only along the southern quadrant of the storm. At 5 a.m. EDT (0900 UTC), the center of Tropical Storm Frank was located near 23.6 degrees latitude and 123.7 degrees west longitude. That's about 875 miles (1,410 km west of the southern tip of Baja California. Maximum sustained winds have decreased to near 40 mph (65 kph) with higher gusts. Frank was moving toward the west-northwest near 9 mph (15 kph), and the National Hurricane Center expects a gradual turn toward the west and west-southwest over the next 48 hours as the storm weakens. NOAA GOES-West infrared image of Tropical Storm Frank was taken on July 28, 2016 at 1315 UTC (9:15 a.m. EDT). The GOES-West image showed very weak storms and mostly along the southern quadrant, as the infrared imagery from AIRS had shown 16 hours before. The GOES image was generated at the NASA/NOAA GOES Project at NASA's Goddard Space Flight Center, Greenbelt, Maryland. Forecaster Pasch at NOAA's National Hurricane Center (NHC) said that "All of the deep convection associated with Frank has dissipated, and since the cyclone is moving over waters cooler than 23 degrees Celsius, regeneration of thunderstorms within the circulation is not anticipated. Therefore, the cyclone is likely to degenerate into a post-tropical remnant low pressure area later today. NHC said that the storm will continue to weaken as the circulation spins down over the next couple of days. Frank is expected to dissipate by Sunday, July 31.